Thousands of people in Tokyo have rallied against nuclear power as the government and utilities prepare to restart reactors in southern Japan. More than 5,000 protesters gathered at Hibiya Park in Tokyo on Saturday to pressure the government not to restart the country’s nuclear power stations. Regulators are currently reviewing whether to let Kyushu Electric Power restart two reactors at its Sendai power plant. Saturday’s demonstration came days after the country marked the third anniversary of a 9.0-magnitude earthquake that struck northern Japan in March 2011. The earthquake prompted a deadly tsunami along the northern Pacific coastline and huge waves swamped already damaged cooling systems at the Fukushima Daiichi Nuclear Power Plant, resulting in three reactor meltdowns and explosions that spewed radioactive materials into the vast, rural region. The wrecked plant, which continues to vent radionuclides into the atmosphere and leak tens of thousands of gallons of contaminated water into the Pacific Ocean, is expected to take at least 40 years to stabilize. The surrounding area will show high levels of radioactive contamination for decades to come. Workers also rallied outside Maeda Corp Friday, one of the contractors hired to clean up the plant and surrounding areas. The earthquake and tsunami killed 15,884 people and left 2,633 people still missing. Supporters of nuclear power, including the prime minister, Shinzo Abe, said Japan needs atomic energy to ensure the economic health of the world’s third largest economy. But protesters at Saturday’s demonstration argued that the country can live without nuclear power as it has done for most of the last 36 months. “Nuclear plants have been closed, so you cannot say we cannot live without nuclear energy,” anti-nuclear campaigner Junichi Okano said. All of the nation’s roughly 50 commercial nuclear reactors have gradually been shut down since 2011 and remain offline due to unprecedented public opposition to restarting them. Questions have continued to mount about the working conditions created by the web of Fukushima contractors and sub-contractors. Several thousand employees at the plant are locked in a daily and dangerous scramble to keep the site from again spiraling out of control, making myriad repairs and building tanks for the vast amounts of water contaminated after being used to cool the fractured reactors. Some demonstrators on Friday said they received far less pay than promised as various layers of bosses docked money for supplying meals, transportation and other expenses. 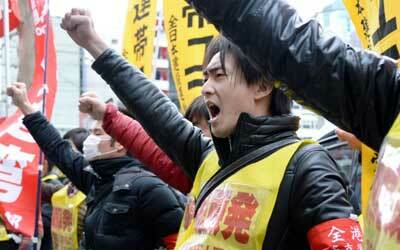 They also said many had not received a 10,000 yen daily premium ($98) for decontamination work. “Workers at the Fukushima plant have been forced to do unreasonable tasks with no decent safety measures,” said one man in his 30s, who declined to give his name. He said he was laid off after several months in the job due to heavy radiation exposure. “Workers are forced to handle contaminated water in such grim working conditions, where any human being should not be put to work,” he said. Maeda Corp did not immediately respond to a request for comment about working conditions in the stricken area.